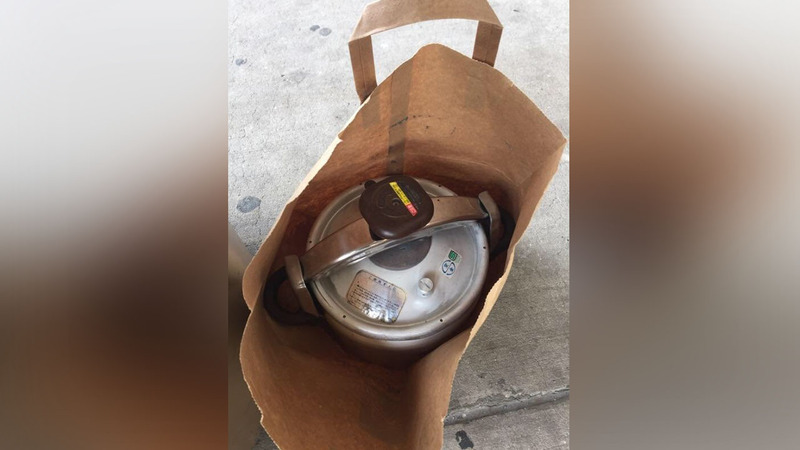 NEWARK, New Jersey -- Port Authority police say the pressure cooker that was left by a trash can and sparked a weekend scare at Newark Liberty International Airport was placed there by a man who was moving his kitchen appliance and told it was too big to fit on the airplane. The man, in his 40s, was reportedly identified using video from surveillance cameras. Authorities say he had arrived on a domestic flight and was planning to take another flight to Texas, where he was relocating from New Jersey. He reportedly attempted to take the pressure cooker onto the connecting flight with him as a carry on, but he was told it was too big. So instead of attempting to check it in at the airline counter, he reportedly decided to throw it away by placing it into an outdoor trash receptacle outside Terminal A. It was apparently too big to fit through the top, so he left it in a bag next to the bin, eventually sparking the scare. The passenger was interviewed the next day, and it was determined there was no criminality. In an exclusive interview, the TSA agent who found the pressure cooker said it was an alert American Airlines worker doing curbside check-ins who first noticed it.